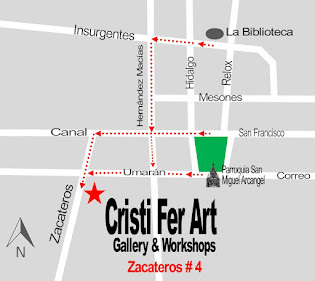 Cristi Fer Art Gallery and Workshops, in San Miguel de Allende, Mexico: One Painting in One Day painting workshop for all level of painting experience attension returning participants! 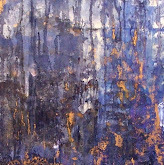 One Painting in One Day painting workshop for all level of painting experience attension returning participants! One Painting in One Day workshops in Riviera Maya, Mexico in 2008. Every year they added new topics and twists to the concept. 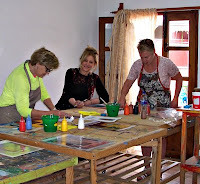 Experience painters and teachers, they constantly improve and update their workshops, adding new elements for returning students and advance painters. "Just arrive with an open mind and be willing to make mistakes. 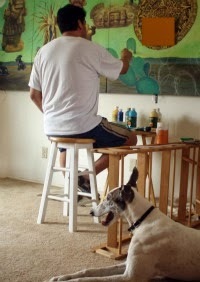 If you always wanted to ENJOY painting, NOW is the time!" Maestro Gonzalez is emphasizing to students. The instructors will help you improve and evolve each session, even when attending the same workshop two or three times. A new painting will be born! You will learn and practice new techniques and improve your painting skills! The joy of painting is endless!